This is one easy and very creative dessert as you can use any kind of fruit you would like. 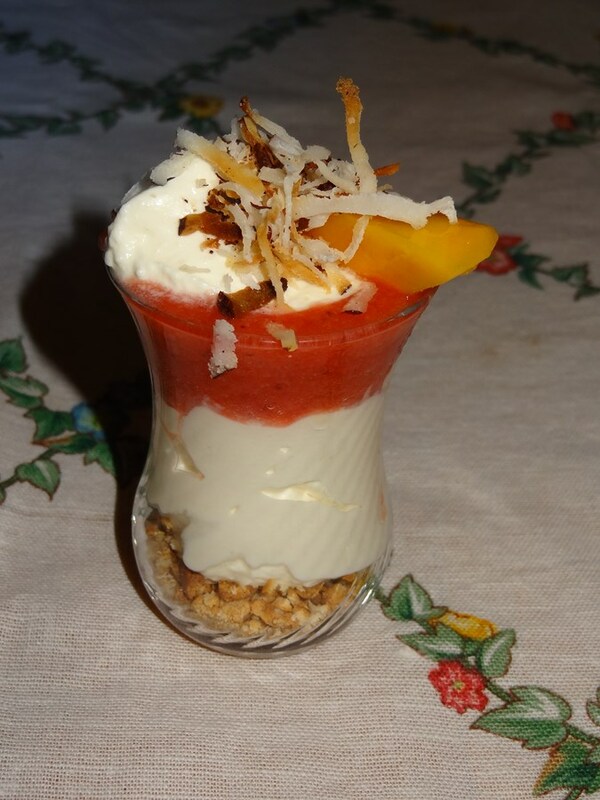 Living in Niger, I use strawberries in season and mangoes… One of our favorite quick dessert. Pulse the graham crackers or cookies in a food processor- add to the bottom of cup. Mix the Greek Yogurt, with some sugar, vanilla and a bit of whipped cream. Mix with a spatula. Taste to see how sweet you want it. Add some of the yogurt mixture in bowl. Make a strawberry sauce with fresh or frozen strawberries and sugar. When cooked, mix. Add cool on top of the yogurt. Add another layer of yogurt and some whip cream to top it. Add slices of mangoes and freshly roasted coconut. You can imagine any kinds of combinations of fruit… it’s light and delicious.